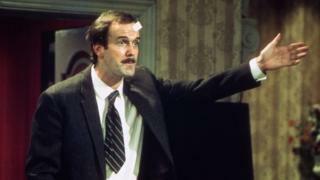 Like some latter-day Basil Fawlty, Boris Johnson mentioned the War and didn't get away with it. The foreign secretary urged the French president not to "administer punishment beatings" on Britain for choosing to escape the EU "rather in the manner of some World War Two movie". Not surprisingly, uproar has ensued. Former Labour leader Ed Miliband said Mr Johnson had shown once again that he could be "supremely clever and yet immensely stupid". To some Britons, Mr Johnson's remarks will be seen as colourful but unexceptional language that echoes the popular World War Two film The Great Escape. To many of Mr Johnson's generation, these films were part of their childhood and are subject to frequent cultural reference. Former Prime Minister David Cameron has seen The Guns of Navarone more than 17 times and once quoted a line from the film in a party conference speech. I know one former Conservative cabinet minister who can quote reams from Where Eagles Dare. (Full disclosure, so can I). Yet this hinterland of war films from the 1960s and 1970s, seen by some today as jingoistic, can create a tin ear among some Britons when it comes to recognising how sensitive many Europeans remain towards this period in their history. The foreign secretary has form on this. During the referendum campaign last year he compared the EU to Nazi Germany, telling the Daily Telegraph both were attempting to unify Europe: "Napoleon, Hitler, various people tried this out, and it ends tragically." This caused a flurry of headlines and a social media storm that passed quickly. Yet the impact on EU politicians was lasting. One EU diplomat explained it to me like this: "You Brits don't understand us when we talk about European values. To us they are important because they are not Nazi values, they are not Vichy values, they are not fascist values, not the values of the Greek junta. They are the values of a different Europe. "So for that clown to compare us to the Nazis, well, that hurts and will not be forgotten." In other words, the global conflict from which the EU's forerunner emerged - and was ultimately designed to prevent recurring - lingers long in the mind on the continent. So perhaps the foreign secretary might take the advice of Gisela Stuart, the German-born Labour MP for Birmingham Edgbaston, who said she was sure her fellow Brexit campaigner did not mean to be offensive but added: "For the next two years… just don't mention the war." Or maybe Mr Johnson might remember the last line of the Fawlty Towers episode when a ranting Basil is being led away by the nurses and one of the stunned German guests asks: "However did they win?"